Leading Manufacturer of paper mill machinery from Ahmedabad. Our company is one of the well recognized organizations engaged in offering an extensive range of Paper Mill Machinery which is made as per industry standards. Appreciated amongst our customers for their reliable and efficient performance, this Paper Mill Machinery is in huge demand in the market. Manufactured robustly using modern technology, these machinery have earned us tremendous of success in the industry. 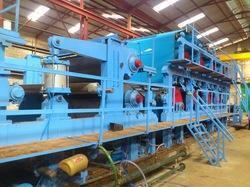 Looking for Paper Mill Machinery ?